There's plenty of things I'm interested to see take place during tonight's season opener against Maine. Right at the top of the list is just how the UConn coaching staff decides to use junior linebacker/defensive end Cam Stapleton. If there was a player who had a more impressive spring game than Stapleton, his name escapes me at the current time. Yet, he heads into the Maine game still listed as a backup to Luke Carrezola. Early in preseason camp I did notice Stapleton and Carrezola out on the field together and asked UConn coach Bob Diaco about the possibility to using the two together. "Cam and Luke can definitely play together," Diaco said. "We are taking a look at Cam as the other outside linebacker. If he ends up becoming one of the best ones then it will be Cam and Luke so you will see a lot of plays with both of them. Based on style of play, Cam is a big physical player, he might he a different kind of tool to use to do a specific job opposite Carrezola. If we are playing an empty team, (no backs in the backfield) it is all spread out and we have to do work than maybe it is not Cam so it gives us more flexibility to add a little pressure where it is needed." So what does Carrezola think about the potential of being on the field at the same time as Stapleton? "Me and Cam work on pass rush a lot together and seeing him on the field brings another spark to our defense," Carrezola said. "He is a great player. We push each other to get better." 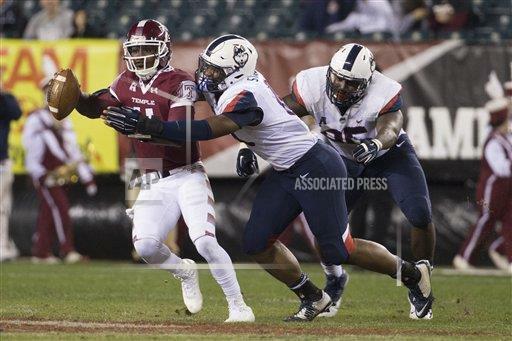 UConn tied for 94th among FBS teams with 21 sacks a season ago and tied for 92nd with 67 tackles for loss. Carrezola led the team with 11 1/2 tackles for loss while Stapleton had four in a reserve role. They also combined for eight sacks so having the two of them out there together would help in the pass rush department. "We are trying to wreak havoc back there, trying to get that quarterback to get the ball out early, mess up his timing, hit him and get him on the ground," Carrezola said. Stapleton figures to spell Carrezola as he did last season but he is too good of a player to merely be a reserve. He will be up for whatever role the coaches have for him including playing alongside Carrezola. "Me and Luke out there together, it is going to be something crazy, it is going to be a sight to see," Stapleton said. "It is great to be alongside another brothers like Cole (Ormsby), Foley (Fatukasi) and just thrash around, be great players." Stapleton said it was not much of a struggle to learn how to play the outside linebacker slot opposite of Carrezola (one where Vontae Diggs is likely to be the starter). "It is an easy position," Stapleton said. "It is basically like a defensive end, something I played in high school so being able to switch over and play defensive end. Playing linebacker, I love it. I never played it until I came to college and it is awesome to play now." Speaking of Carrezola and Stapleton, they have the benefit of having not one by two defensive coaches who were on the College Football Hall of Fame ballot. Last year I caught up with defensive coordinator Anthony Poindexter when he was on the 2015 ballot. This year he was joined by Vincent Brown and I recently got Brown's take on being recognized with a spot on the Hall of Fame ballot. "It was a tremendous honor to be recognized for your efforts as a player," Brown said. "When I first found out, I was extremely humbled and honored, regardless of the outcome of the ballot there are some tremendous names on that list that I just feel honored to be mentioned in the same breath win." At some point I will have to research this but I can't think there are too many college coaching staff with two assistants on the College Football Hall of Fame ballot. "Pretty neat, huh?" Brown said. "Having the chance to work with Dex for the last seven years now, knowing what kind of player he was and an even better coach, well deserved." Finally, feel free to check out my season preview on UConn finally having some offensive continuity and also a feature on UConn commit Ryan Fitton.